Udupi, Apr 19, 2018 : Sri Lakshmivara Theertha, the present pontiff of Shiroor mutt in Udupi, has decided that if the saffron party does not plan to give him a ticket he will contest from Udupi as an Independent. Though mutts in Dakshina Kannada district do not have the kind of sway seen in North Karnataka, Lakshmivara Theertha entering the contest could upset the applecart of the party banking on a particular community’s votes by splitting them. 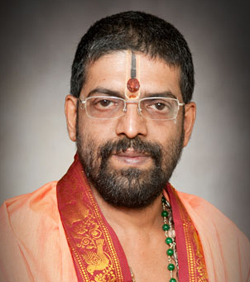 “Since the BJP does not intend to give me a ticket to contest from Udupi assembly constituency, I will file my nomination as an independent,” said the seer. He will file his nomination by April 21. Lakshmivara Theertha feels people living in villages have been untouched by development. His focus will be on agrarian villages that have not been touched by development. He also wants to check migration of villagers to cities in search of employment. The seer had got into a controversy last month with his alleged comments against the seers of the Ashta mutts. The Pejawar seer called for action to be taken against Lakshmivara Theertha. An electronic media channel had aired a voice clipping alleged to be of the Shiroor seer, stating that he had children, and that the seers of other Astha Mutts too had children. “Since we are pushed into sanyasa at a young age, we too have desires,’’ he had stated in a voice clipping, that was alleged to be his. However, the Shiroor seer, after the clipping was aired, clarified that he had not spoken these words, and that someone had tried to mimic his voice. He also said that the clipping was sixmonths-old, and that he had taken the matter to court.